Patio Pavers Introduction - Tile Tech Inc.
With the steady growth of the aging population comes the shift in trends of favourite past times and hobbies. In America, more and more people are being hit by the cocooning wave. A growing number of Americans prefer to spend lots of time at home particularly on their own outdoor spaces. Porches, decks, and patios covered with concrete patio pavers have become the go-to places for personal relaxation, cooking and entertaining guests. It is not surprising to find backyards being transformed to luxurious extensions of a house. Among home improvement materials, patio pavers are becoming increasingly popular due to their aesthetics, durability and affordability. Patio pavers is a collective term used to refer to any type of paver, such as concrete patio pavers, that is utilized in the construction of an outdoor patio deck. These materials add vibrancy and elegance to patios, making them more inviting and relaxing spaces. In general, patio pavers are classified into three main categories based on the type of raw material used to manufacture them. 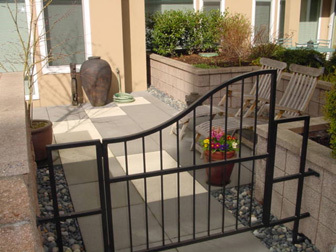 Concrete patio pavers fall under the concrete pavers category. As the name suggests, these are pavers made from concrete. Brick pavers collectively refer to pavers that are made from clay, while stone pavers refer to pavers made from natural stones such as granite and sandstone. These pavers are available in a variety of shapes, colours and sizes to suit any design concept or impart a particular mood. Basket-Weave – In this pattern, pavers are laid vertically and horizontally to replicate the basket weave design. This is ideal for casual settings. Circle – Brick, stone or concrete patio pavers are laid to form a circle design. This pattern is very popular yet it can be difficult to install. The challenging part of this pattern is the formation of the curves. Fan – A pattern of gentle arches is used to replicate the fan. This pattern is typically applied to walkways and driveways. Random – This pattern uses four different sizes of pavers in one application. 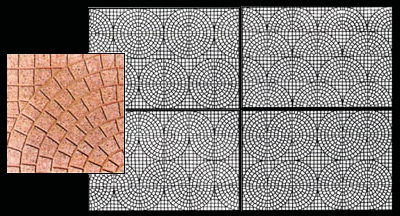 Mixed – This pattern uses three to four different shapes of pavers and is commonly used as borders of the Circle and Fan patterns. Using patio pavers will potentially enhance outdoor spaces. Create more visually appealing environments to complement outdoor spaces with these materials. “Patio pavers” is a generic term given to describe any regular type of paver that is specifically used for the construction of an outdoor patio deck. Patios are constructed primarily for the enjoyment of outdoor living spaces. Each of the above paver groups has a multitude of paver products that are manufactured in an endless selection of colors, shapes, patterns and sizes that would be suited for patio paving applications. Therefore, just about any type of pavers can be used for building a patio. In essence, any regular paver product can be used to make a patio and as such is described as being a ‘patio paver’. When it comes to installing your chosen Patio Pavers, there is a variety of patterns and designs to consider. This is the most formal of the patterns available and the most popular, it is a zigzag type if design and is ideal for the cover-up of irregular areas. This is a simple yet versatile pattern type. It is also very popular for use on Patios and small areas. Pavers are laid at an angle to create a curve pattern. The Basket-Weave pattern is suitable for casual applications. This pattern is often used with another type of design, or it can be used alone. Pavers are laid vertically and horizontally in pairs. This is a popular and sometimes difficult design to install, where pavers are laid in a circle design, creating the curves can be challenging. 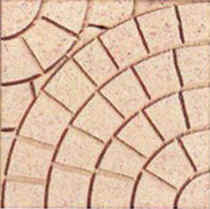 This design brings a pattern of gentle arches, and is generally applied to walkways and driveways also. This design involves the use of about four different sizes of patio pavers for the one application, creating a bold effect. It is also used for walkways and driveways. This design involves the use of about three to four different shaped pavers, often used for borders, the Circle design and the Fan design.